Gstättentor Gate & Salzburg′s "oldest bakery"
A number of ancient gates locked Salzburg to outside intruders. One of the oldest is the Gstättentor Gate, sometimes called Schleiferbogen Gate just next to the Blasiuskirche Church. The lane in which it can be found it called Gstättengasse. This gate includes parts of Salzburg′s oldest city walls from the 13th century, but it was extended and fortified more heavily under Prince Archbishop Markus Sittikus in the 17th century. The coat of arms of Sittikus can still be seen on both sides of the gate. 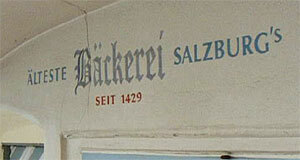 This is not the only attraction of the area: just next to the Gstättentor Gate is supposedly Salzburg′s oldest bakery - today used as an art gallery. We don't know how this legend started, but in fact, the oldest bakery of Salzburg is the one of the abbey St. Peter, which was founded in 1229, is still running and was hardly changed since its foundation.